Gor Mahia recovered from their midweek loss to edge Mathare United 1-0 in a match played at Nyayo stadium on Sunday. The all important goal came in the 55th minute. Veteran defender Edgar “Fighter” Ochieng fouled Dan Sserunkuma in the 18 yard box. Sserunkuma himself stepped up to take the penalty and made no mistake to give Gor Mahia the crucial winner. The match was evenly balanced in the early exchanges. It was Mathare who almost took the lead as early as the 2nd minute when former Gor Mahia player Kevin Ochieng forced a save from Jerim Onyango from a freekick. Edwin Lavatsa was lively throughout the game giving the Mathare defense some tense moments. In the 27th minute he forced a fine save from Joseph Ruto when he picked up a through pass from Ali Abondo forcing the Mathare custodian to come off his line and make a save. In the second half, Ivan Anguyo came in for Joseph Njuguna while Moses Odhiambo came in for Kevin Omondi. Mathare too rung changes in a bid to grab an equalizer but Kogalo defense thwarted their efforts. However Mathare’s Emmanuel Tostao kept Gor Mahia defenders busy and twice came close to scoring after beating his marker. Only innacurate finishing stopped him from equalizing. Gor Mahia now have six points from three matches. Gor Mahia coach Zdvarko Logarusic has cited the rash of injuries the team has suffered for the current spate of bad results. He said the the loss of striker Paul Kiongera and Moses Odhiambo, who did not start the game, and that of Rama Salim who limped off before half-time, played a crucial role in the loss to Ulinzi. “The pressure was on us. We had a lean squad. 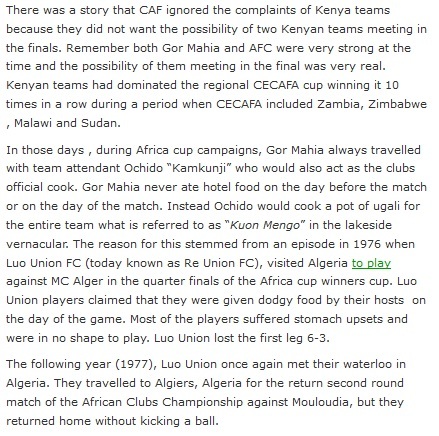 Ulinzi were strong and experienced,” Logarusic told the Daily Nation. On Wednesday , Logarusic opted for Rama Salim and Dan Sserunkuma upfront. However the duo have yet to recover the form which set the league ablaze last season. Rama in particular does not seem to have recovered from his injuries and will probably be rested for the foreseable future. “Losing is part of the game. I know it is hard for the fans to take it. They have gone for long without a loss. And I also think this is a wake-up call to all of us in the team that we have to work harder this season. Last season we lost the league by a point. This season we must do better,” he told the Daily Nation. Gor Mahia’s 20 match unbeaten run came to an end when they lost 0-2 to Ulinzi in a midweek Tusker premier league match. The last time Gor Mahia lost was in April of 2012. Gor Mahia started at a fast pace with Edwin Lavatsa, Rama Salim and Dan Sserunkuma routinely strethcing the Ulinzi defence. Ulinzi started to come into the game around the quarter hour mark and were rewarded with a goal by Evans Amwoka on 23 minutes. Gor Mahia pressed for an equalizer but could not breach the bunker Ulinzi defence. In the second half Gor Mahia continued to pin Ulinzi in their own half for lengthy periods but still could not find a breakthrough. On one of their few forays into the Gor Mahia half, Ulinzi scored the second goal on 76 minutes. Gor Mahia will now have to pick themselves up and get ready for the CAF cup return leg against ENPPI of Egypt who had scouts at the stadium on Wedensday. As Gor Mahia prepare to resume their 2013 title chase coach Zdvarko Logarusic has chosen to rest the two players who travelled with the national team to Nigeria last weekend. Edwin Lavatsa and David Owino “Jashirati”. The latter is nicknamed after the legendary Tanzanian musician Daniel Owino Misiani who was from Shirati Tanzania and was often referred to as Jashirati. Owino had a busy time tailing Victor Moses of Nigeria throughput the match last weekend. He performed his duties with distinction and will have earned his rest. Logarusic indicated that the two are being rested to avoid fatigue and to allow them to recuperate fully before the next game. David and Lavatsa will be rested because they have been away with Harambee stars and it is just fair enough and professional to give the two players time to rest,” he said. Raphael Mungai Kiongera and Moses Odhiambo “Dube” are still out nursinh injuries. Which means that Dan Sserunkuma and Rama Salim will most likely start upfront. Kenya were unlucky to concede a late goal to Nigeria after taking a first half lead. The Kenya goal came from Francis Kahata. The Thika United midfielder scored with a sublime freekick which he curved around the Nigeria wall past the outstretched hands of Victor Enyeama in the Nigeria goal. Versatile Gor Mahia player David Owino “Jashirati” was deployed at right back and had the arduous task of marking Victor Moses who plays for Chelsea in the English premier league. And Moses was handful with his mazy runs down the left flank. Late in the first half he looked certain to score only to be foiled by the outstretched leg of Owino. The second half was no different as Moses continued to look for gaps in the Kenya rearguard. 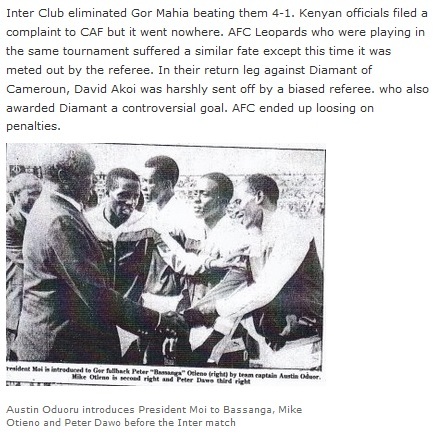 Owino acquited himself well considering that he was going against an EPL player. 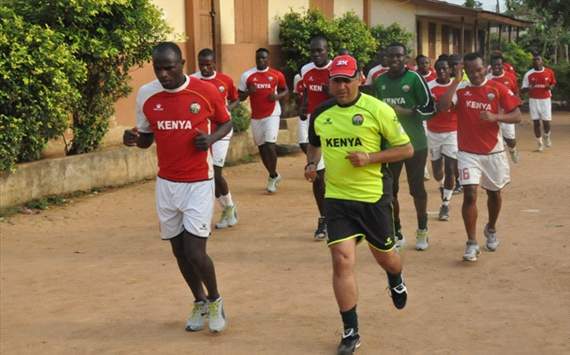 He was the busiest of the Kenya players and worked his tail end off. He will have earned valuable experience. Kenya hung tough throughout the game fending off wave after wave of Nigerian attacks. In truth , though, Kenya did not look dangerous going forward. They created one real chance in the second half when Dennis Oliech released Francis Kahata. With only the keeper to beat, Kahata slipped and sliced his shot off target. Edwin Lavatsa was introduced late in the second half. It was an inexplicable substitution given that Kenya needed to add more steel to their defence. Lavatsa had a chance to take on the Nigerians with his blistering pace but instead played the ball backwards perhaps in caution. Arnold Origi, son of Kogalo legend Austin Oduor Origi , once again had an oustanding game in goal. Calm confident and able to marshall the defence. Kenya was able to string passes together for periods. However they did not create much offense going forward. Oliech who was Kenya’s lone striker hardly received any decent balls. Amrouche will need to work on getting the ball forward. Nevertheless, Adel Amrouche appears to have instilled a sense of determination in Harambee stars which bodes well for the future. Gor Mahia will resume their 2013 Tusker premier league on Wednesday with a match against Ulinzi Stars. The match will be played at City Stadium. It will be the second game of a double header. The first match between Mathare and Sofapaka will be at 2pm. Gor Mahia vs Ulinzi will be at 4pm. With Harambee stars returning from Nigeria on Sunday, it might turn out to be a good thing that the likes of Anthony Akumu, Kevin Omondi and Rama Salim were not included in the Stars travelling squad. And Dan Ssserunkuma who had been initially named to the Uganda Cranes squad that is due to travel to Liberia this weekend also did not make the trip as he was excluded at the last moment. His presence will be needed especially now that Raphael Kiongera is out with an thigh injury. Ulinzi have so far played four matches, of which they have won one drawn two and lost one. That is a slow start but the Soldiers are always a tough nut to crack. Defender David Owino and striker Edwin Lavatsa have been named by new Harambee stars coach Adel Amrouche. Lavatsa has been in sensational form recently for both club and country. He would be a perfect person to partner Dennis Oliech upfront. Omitted from the team are several key players including Gor Mahia’s defensive midfielder Anthony Akumu. Yet Akumu is exactly the kind of defensive bulwark that Harambee stars would need when facing the defending Africa nations cup champions. Other Kogalo players who previously featured for the national team like Rama Salim and Kevin Omondi have also been omitted. Also missing from the squad are stalwarts like Jockins Atudo, Humphrey Mieno and of course MacDonald Mariga who has decided to boycott the national team. Based on current form, former Gor Mahia pass master Peter Opiyo should have also been included. Strikers: Christian Bwamy, Dennis Oliech, Jacob Keli. Gor Mahia coach Zdvarko Logarusic blamed a number of factors for the 0-3 loss on Friday. “We did not play very well, we gave them so much space” Logarusic said to the Nation. However with a lineup that had 3 strikers, 2 attacking midfielders and only 1 defensive midfielder it is not clear how Gor Mahia were going to press the Egyptians. It was the same formation he used in Victoria against Anse ReUnion. People who have seen how effective Egyptians teams are at exploiting defensive lapses would have advised him to shore up the defence. He also attributed the loss to the absence of striker Paul Kiongera and midfielder Moses Odhiambo. 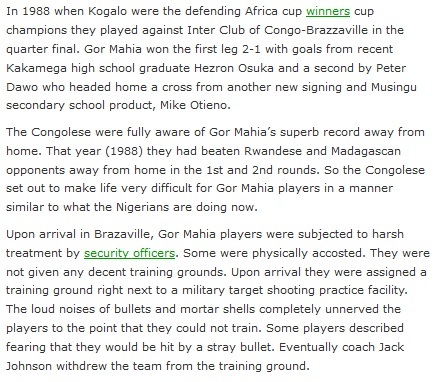 Given that Gor Mahia’s problems were defensive one has to question that rationale. He indicated that uncertainty played a key role in the poor result. “Our preparation before the Egypt match was not the best. At some point, we didn’t even know how we would travel because of lack of funds. We cannot prepare for such a match this way and hopefully our preparations for the second leg will give us positive results,” he told the Standard..Nevertheless as a coach, one of his primary jobs is to keep players focused and motivated even in cases of uncertainty. In reality, uncertainty should never be an excuse unless it is a case where players are not being paid. Coach Logarusic has done a marvelous job since he joined Kogalo and none of these critiques are meant to take away from the fact that he is an excellent coach. However Gor Mahia fans who have been starved of continental success for years are eager for a good performance after 18 years of mediocre performances. One thing Loga should do is consider having a discussion with coach Ezekiel Akwana, the only Kenyan coach ever to slay an Egyptian team and who seems to have a wealth of knowledge on North African teams. Not only did he beat Ismailia, he came very close to beating Club Africain of Tunisia. Egyptian teams are also known for studying other teams in detail and always send members of their technical bench to study their opponents. It is not clear how much Logarusic knew about ENPPI beforehand but he must now busy himself with ENPPI videos and find weaknesses that Gor Mahia can exploit. Gor official Ronald Ngala, who witnessed the match, claimed his side missed many scoring chances that would have given them the away-goal advantage. For his part, ENPPI coach expressed Tariq El Ashry said, he is very happy to win by three goals, because the results gaves them a level of comfort but quickly added that they do not qualify for the next round,until the return match in Kenya. 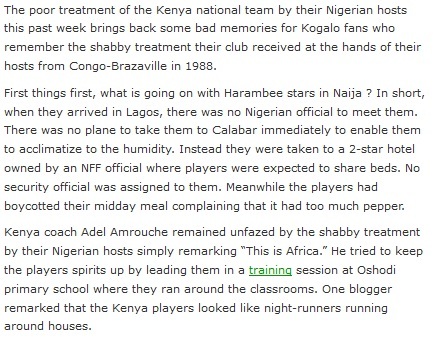 He also lauded his team for playing well despite suffering from extreme exhaustion due to playing too many games. Meanwhile Gor Mahia are set to arrive from Cairo on Sunday. One hopes that fans will show up at the airport to give the coach and the players moral support for the uphill task ahead.